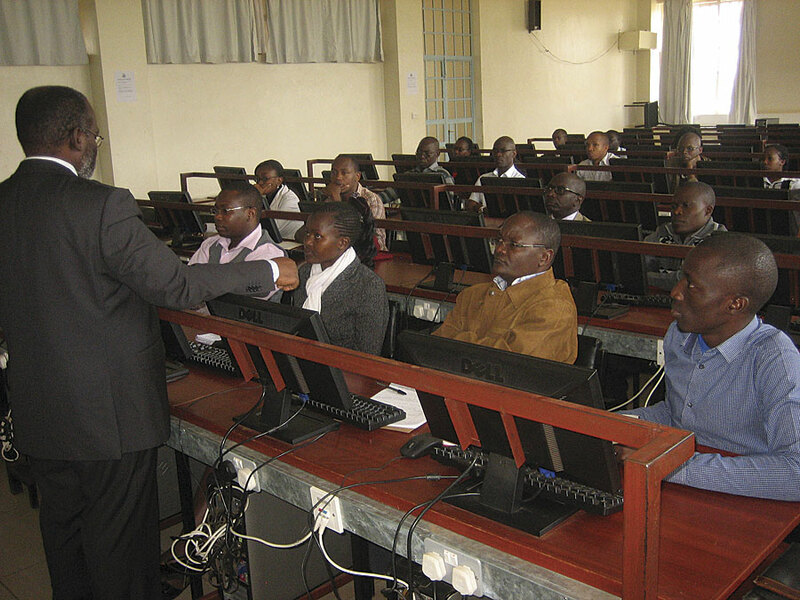 After implementing an Esri enterprise license agreement under the 100 African Universities program, it took Kenyatta University in Nairobi, Kenya, less than two years to expand its use of GIS technology from a research tool limited to a few professors and graduate students to a multicampus ArcGIS implementation that is a respected center of excellence throughout Eastern Africa. Kenyatta College, established in 1965 in a former military barracks, became Kenyatta University in 1985. The university takes its name from Jomo Kenyatta, Kenya's first president after it gained independence from Britain in 1963. Kenyatta University currently has 12 campuses that serve more than 88,000 students. Simon M. Onywere, associate professor and lecturer in Kenyatta University's School of Environmental Studies, first discovered GIS as an undergraduate student in the late 1980s. Later he was instrumental in implementing GIS in his department, but he long believed the technology held great potential for enhancing studies across the entire university. In 2011, a colleague told Onywere about the new 100 African Universities program announced by Esri at the AfricaGIS conference in Abuja, Nigeria. "Our goal is to foster sustainable GIS curriculums in universities throughout Africa," said Esri president Jack Dangermond. The program provides a free enterprise license agreement for three years to each participating university. The full complement of ArcGIS software is made available through the agreement. After that agreement expires, licensing costs are determined by the university's ability to pay. "The benefit of the 100 African Universities program is very clear," said Onywere. "It provides the opportunity for students and faculty throughout our university to use ArcGIS in their coursework and research. However, Esri is specific in its requirements for universities to obtain the enterprise license, particularly for computer infrastructure, which, I think is very important for the success of a campus-wide GIS implementation." Onywere began the application process for the enterprise license for Kenyatta University in 2012. He soon determined that the existing server space at the university was not adequate to support the anticipated use of ArcGIS and had to convince the vice chancellor of the university to buy additional space. By September 2013, GIS was fully available across the entire campus. Introductory courses in ArcGIS aided the adoption of the softwre across the campus. "At that point, I felt a great sense of relief and satisfaction," said Onywere. "The university had put in place the required server infrastructure and provided the necessary network access and other computing resources needed to enable our staff and students to use ArcGIS software in their research." To support the educational needs of students and faculty learning geospatial technology, Esri provides a wealth of online materials, including books, courses, and related course materials as part of the 100 African Universities program. "After we explained the benefits of using ArcGIS in their work, the students seemed very enthusiastic about learning this new and powerful technology," said Onywere. "My assumption was that because the students are Internet savvy and Esri provided a wide variety of online educational materials, they would quickly begin studying the available self-tutorials." Much to Onywere's surprise, this was not the case. "When I noticed that the students who were initially enthusiastic about the opportunity to learn ArcGIS were not using it, I started to ask some questions. Basically, I found they needed introductory training to make them more familiar with the ArcGIS software." Concerned about this stumbling block and the possibility of the enterprise license remaining underused after the efforts required to have it fully implemented across campus, Onywere began developing an introductory ArcGIS training course that was modeled on the university's existing curricula. "Creating a customized introduction to ArcGIS based on materials the students had some knowledge of was the key," said Onywere. "Though I really did not anticipate personally teaching GIS when I first began this project, I found that it was necessary, and this little boost provided the incentive and confidence the students needed to pursue learning the technology on their own. The pretraining became fundamental to the growing success of geospatial literacy at Kenyatta University." To expand his teaching efforts, Onywere approached the university's former Institute for Research, Science & Technology, which had partnered with the International Centre of Insect Physiology and Ecology (ICIPE) in Nairobi. 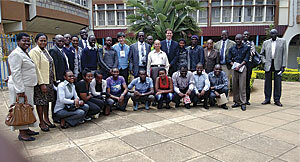 Kenyatta University School of Environmental Studies faculty pose with visiting Esri staff members Joseph Kerski and Michael Gould. The Institute was working with ICIPE on its Community of Excellence for Research in Neglected Vector-Borne & Zoonotic Diseases (CERNVec) initiative. Using GIS, the research group was trying to better understand the spread of these diseases to control them. Because CERNVec had a well-established GIS capability, Onywere was able to convince them to provide two staff members on an internship basis to assist with his training at the university. This assistance helped the university expedite training. By the end of the first year, more than 1,000 Kenyatta University students had learned how to use ArcGIS. Today, GIS is used in more than 15 areas of study throughout the university including the School of Hospitality and Tourism Management, which is mapping tourism resources in Kenya for easier planning, marketing, and research. In addition, the University Geographical Data Portal has been implemented to provide easy access to university mapping projects and other initiatives. An overarching objective of the Esri enterprise license agreement for Onywere is to prepare Kenyatta University students to support the government and its people in achieving the goals outlined in Kenya Vision 2030. 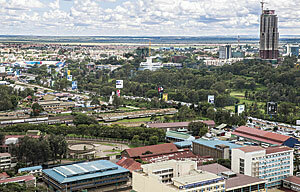 This is a national redevelopment program launched by former President Mwai Kibaki in 2008. The program is founded on three pillars: economic, social, and political, with the intention of increasing the quality of life, social well-being, and democratic voice of all its citizens. "I am certain that the breadth of GIS applications can play a significant part in helping our country realize the goals of Vision 2030," said Onywere. "Whether it is environmental management, land reform, increasing agriculture yields, urban planning, infrastructure development, and so on—geospatial technology can help with analyzing the problem and providing fact-based solutions. These are the very fields of study our students are pursuing, and their newly acquired GIS skills can be applied directly to achieving the goals outlined by our government."